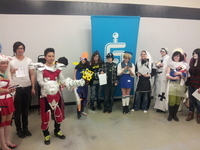 Outpost Anime - Anime Twin Cities, Inc. The harsh winters of Minnesota result in a season where conventions and other large events for anime fans are few and far between. Outpost Anime provides an oasis from the cold where fans can gather, watch anime, do cosplay, participate in fun activities, and win prizes. It's open to all, family-friendly, and free! 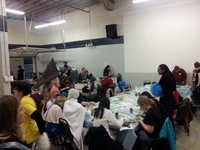 Anime Twin Cities, Inc. invites one and all to their annual winter festival, held in January at the Geek Partnership Society. Outpost Anime is a full day of social, creative, and relaxing things to do. Crafts: There are several scheduled craft activities throughout the day, from jewelry making to cookie decorating. Gaming: Tabletop (board) games are provided for all ages to play. Anime: Tsuinshi runs a video room for attendees to enjoy. Cosplay: Outpost Anime includes a popular-vote cosplay contest and an “Iron Cosplay” competition, where teams of participants are challenged to make costumes out of scrap materials. Group games: Giant Jenga, Hot Potato, and other party games offer opportunities to have fun and win cool stuff! The best part is, all of these activities are free! Donations are welcome, and there are snacks available for sale, but there is no charge to attend the event. Brave the frozen tundra and meet new friends at the Outpost!